For all the grandeur that’s available in the burlesque scene, I’m grateful for the smaller shows. And for Seattle’s many strong troupes, I love a show that serves as a sampler of performers- both veterans and newcomers alike. Which is a roundabout way to explain why I’m really happy to add the Academy of Burlesque’s Alumni showcases to my roster of semi-regular shows. I went to West Hall on Friday night for a night of rock and roll (or, as the genuinely ethnic host Flirty Sanchez put it in her native tongue, “rrrock y rrroll”) and was not disappointed. The audience was treated to fan dances, greased lightning, southern belles gone to seed, cookery, a biohazard addict and one very naughty teacher. And if that wasn’t enough we had Iva Handfull, fresh from her debut at the Burlesque Hall of Fame, performing a modified version of her Firestarter fan dance. The standout acts of the evening really demonstrated the breadth of styles that the Academy embraces. The first featured Donatella MeLies in silver body paint and garbage bags as… what, exactly? A spirit of garbage? Recycling gone wrong? Does it really matter except that it was unlike anything I’ve seen in recent years. She really owned the stage and brought such flow to her act that I was captivated. 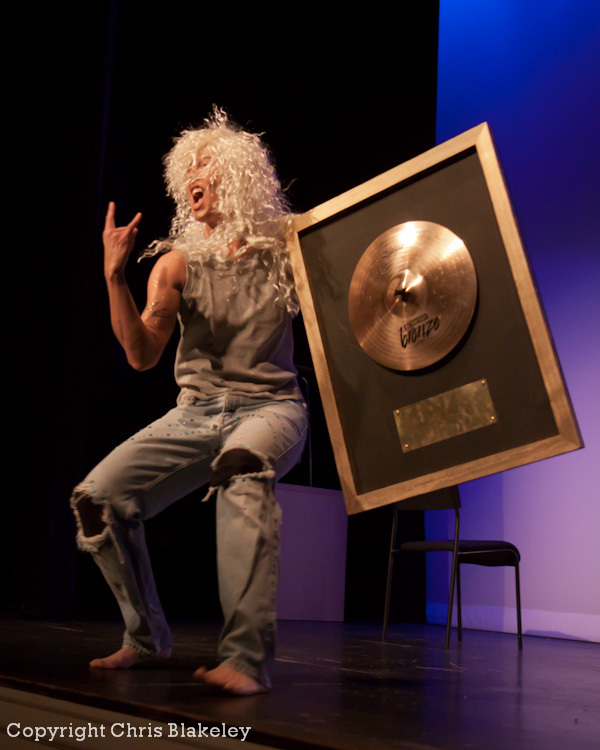 The other standout act was Piston Chambers, featuring a washed-up drummer from a hair band from the 1980s (disclaimer, I helped write and perform her voice-over narration) that included gratuitous spandex, drum solos and creative use of cardboard. Yes, we have amazing talent. Yes, it’s great to go to the Triple Door to take in the spectacle. But do yourself a favor and check out the Alumni of an evening. I don’t think you’ll be disappointed. Iva Handfull in a reprise of "Firestarter". Cute girl in a tube top? The lovely Atlanta Summer. Piston Chambers- there will be spandex. ~ by angrytruffle on 06/22/2011.